2019 Lok Sabha Election in West Bengal is on the way. Here you can know everything about Schedule of Lok Sabha Election 2019. This Lok Sabha Election 2019 is scheduled to be held in 7 phases from 11 April 2019 to 19 May 2019 and Announcement of the Results of Lok Sabha Election on 23 May 2019. The Election Commission said that this year, the Lok Sabha Election in Bengal will be completed in seven phases. Each phase has different states. The total 42 Lok Sabha constituencies will be made in West Bengal, all the centers and schedules are given below. Voting Districts : Dumdum, Barasat, Basirhat, Jaynagar, Mathurpur, Diamond Harbor, Jadavpur, South Kolkata, North Kolkata. Give your vote. Every vote is important. West Bengal Election, 2019 Lok Sabha Election in West Bengal, Lok Sabha Election 2019 Date In West Bengal. 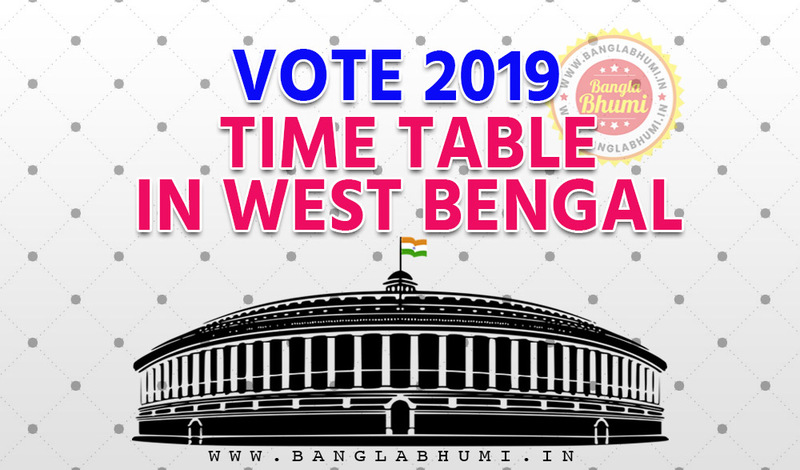 Lok Sabha Election dates 2019 Schedule, West Bengal Voting for Lok Sabha Election from April 11 to May 19, Voting result on May 23 2019.